Cost - do they offer top-notch service as well as reasonable pricing. You should rarely, if ever, select any contractor, especially a tree service, that is the lowest cost. Quality tree services costs money, and if their price is too cheap, it is a sign of problems in their business. With Pensacola Tree, you will be taken care of by a team of trained professionals. All of our employees are fully trained and knowledgable in ISA standards, offering you the best tree care in the area. Additionally, our certified and accredited arborists can help you make the best decision when it comes to tree services, and notably tree removal considerations. Irrespective of the reason(s) you may be contemplating having a tree removed, we will provide you the professional help to eliminate a tree quickly, successfully, and cost-effectively. With our free tree removal estimate process, we can recommend an effective method of getting eliminating a tree, in addition to providing all the other details of the jobs, such as team composition, equipment, other information, such as how we will dispose of the wood. We will provide you with a rock-solid estimate for the job as well as our licensing and insurance documentation. With all of this information, you will be in an great position to make an informed decision as to who is best qualified to remove your tree. What are the company's qualifications, relative to experience, licensing, and industry-recognized credentials? What references do they have, both on the internet and from previous clients? Are they accredited by tree care industry associations, such as TCIA and ISA? Is their insurance documentation provided directly from the carrier - if it is provided directly from them it could be fraudulent? These tips as well as the other criteria are important for you to use when making a tree removal business selection. Tree removals, while not complex, do come with a risk, such as property damage and employee injuries. If conducted by a tree company that is uninsured and/or inexperienced, the risk could be significant for the property owner. Tree service Pensacola trusts is our philosophy and business slogan. All of our employees, equipment, and business/tree care practices are well established to assure you of an efficient and safe tree removal experience. 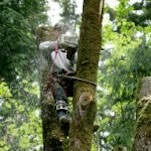 Do not take for granted any tree service can perform tree removals to your safety standards and satisfaction. Some companies will take shortcuts both in procedure and safety, exposing you with a potential risk and damages. Only select a well-qualified tree care provider that has the tools and qualifications to safely remove your trees. Tree Species - some tree species are a bit more time consuming to remove. Trees can grow with multiple trunks are an example of this. Tree Location - a tree that is growing near power lines or a home will take more time to remove due to the safety precautions that need to be taken when removing it. Tree Size - this is the biggest factor in tree removal cost. Larger trees consume more labor to remove, and therefore, cost more. Generally trees are categorized into three sizes: under 40'; between 40' and 80'; and over 80'. Generally trees under 40' will cost between $400 - $800 to remove; tree between 40' and 80' will cost from $800 - $1,200; and trees over 80' will start at $1,200 and up to remove.